At 35" wide, this extra-large Super Wings World Airport playset is the ultimate destination for any Super Wings fan. Just like the Super Wings show, it is an airport full of adventure! Lights and sounds - Press the "W" button on the center of the tower to activate lights and fun phrases! Spinning fly-bar - Securely attach your favorite 2" scale Transform-a-Bot figures and make them circle the sky above World Airport Tower! Elevator - Manually send characters up the airport tower elevator just like in the hit preschool show, then use the tilt-and-release ramp to launch them down either of the ramps! Multiple play areas - Fun activities include rotating luggage carousel, spinning satellite, a cargo scale lift and more! Control Tower - Pretend to be Sky or Jimbo and watch over the entire airport. 2" scale transforming Jett and Donnie figures - Each transforms from vehicle to bot in 3 easy steps and have real working metal wheels. This Super Wings set features 4 fan-favorite characters from Season 2 in the 2" Transform-A-Bot scale: Flip, Todd, Agent Chase, and Astra. Agent Chase - The special agent member of the Super Wings team. He's proud, confident, street-smart and often works on undercover cases. His high-tech gadgets make him one of the coolest wings in the fleet and he can transform into any type of vehicle! Astra - The only Super Wings team member who lives in outer space. She is proud of her deep knowledge of all things scientific and can take in the big picture of what's happening on Earth from her unique perspective. Todd - The ultimate "underground" Super Wings teammate. With his nose drill, he loves diving into the dirt, and doesn't mind getting messy. His drill nose also has many uses: digging for buried treasure, screwing in bolts for teammate Donnie and more. This Super Wings World Airport Collector Pack features fan-favorite characters from Season 2 including 2" Transform-A-Bot scale: Jett, Flip, Todd, Dizzy, Agent Chance, Paul, Astra and Donnie from the hit preschool Super Wings show. Join Jett and his loveable transforming friends, the Super Wings, as they travel the globe to deliver packages, solve problems and help boys and girls around the world on the hit preschool Super Wings series. Every delivery is a unique adventure filled with new cultures, languages and new friends! Super Wings has a special place on the list of hit programs for preschoolers. Its great planes and airplane bots have made of it a surprisingly successful show. Impossible not to have a toy line tied to this cartoon. These action figures make a great impression on Amazon’s little customers with their bright colors. Kids will definitely love playing with these fabulous toys. 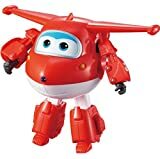 This toy line of Super Wings is on Amazon. It is not difficult to figure out why these toys have become the favorite. When shopping online for gifts, Amazon offers a variety of Super Wings playsets that parents can pick. All of them are recommended for the age, and different brands show nice and cute designs that are sold every minute. The toy line based on Super Wings brings for boys and girls the favorite heroes and heroines that they admire. Jett, Jerome, Chace, Donnie, Paul, Dizzy, Mira, Astra, Grand Albert and some more jump out from the TV screen and come to life in your kid’s small hands. The Super Wings team will be ready for any mission! Kids will be able to interact with these heroes with wings. They can be the little directors of scenes where they create adventure and dialogs with these nice characters. Playing will be fantastic with the options of Super Wings playsets. They will inspire kids to create original stories, besides encouraging heroic behavior. Choosing the right Super Wings figure is a piece of cake because any of them is perfect to take off into the air and deliver packages all around the world. The transforming action of these characters has been the best part of the last season. So having these toys and reenacting the coolest missions from this popular show will be great for children. Fantastic packs will help kids boost their imagination. 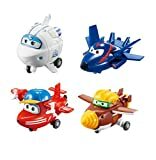 You can find Super Wings sets of fifteen, four, two or just one character. For example, the 4 fan-favorite characters of Jett, Grand Albert, Mira and Paul will delight kids. Children can play with the leader and confident Jett or Paul with his strong sense of duty. They will love Mira being able to fly and dive, and the antique Grand Albert with his young heart and amazing stories. The toys of this set are transforming figures. Vehicles that turn into bots in just few steps. In some seconds, children can transform Jett, Paul, Mira and Grand Albert into 2”scale figures. So they are like two toys in one. One of the favorites is Jett’s super robot suit large transforming vehicle. Just a button, and kids listen to Jett saying phrases from the show. Its sound and light effects are amazing. Jett is all an airplane transformer. Bright colors, good materials and size make it a fantastic toy. The collector pack brings all the world airport crew. It has fifteen beautiful and easy to transform figures. Eight characters transform from planes to bots: Jett, Flip, Todd, Dizzy, Astra, Agent Chace, Paul and Donnie. Other seven figurines accompany them. Jimbo, Sammy and Roy are among them. It is perfect for children who are 3+ years old. Super Wings centers on all the missions that are assigned at the iconic Super Wings Airport. Jett’s Takeoff tower 2-in-1 playset transforms Jett into this airport. Kids press a button, and Jett opens showing a 23” long airport, the same button lets it fold back up. Your kid can have hours of entertainment. It doesn’t require batteries. The World Super Wings Airport playset with transforming Jett and Donnie is another great option. It includes 2 AAA batteries for electronic sounds and lights. It has the control tower and a fantastic elevator. It is 35 inches of fun.